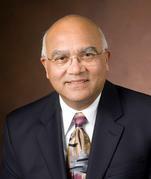 The Purdue Chapter of Sigma Xi announced that Arvind Varma is the winner of the 2015 Sigma Xi Faculty Research Award. He will be honored at the 2015 Sigma Xi banquet on April 8, 2015 in the John Purdue Room. Dr. Varma, the R. Games Slayter Distinguished Professor of Chemical Engineering and Jay & Cynthia Ihlenfeld Head of Chemical Engineering, was nominated and selected for the impact of his work on functional materials for diverse applications such as aircraft turbines, orthopedic implants, fuel cells, membranes and carbon sequestration. Referees noted that he is the most prolific and most cited chemical engineer in the field of combustion synthesis. Professor Varma joined the School of Chemical Engineering as the R. Games Slayter Distinguished Professor and Head in January 2004, and has held this position since then. He has authored several books and over 285 archival journal articles in chemical and catalytic reaction engineering, synthesis of advanced materials and novel energy sources. A Fellow of the American Association for the Advancement of Science (AAAS) and also of the American Institute of Chemical Engineers (AIChE), he is the founding editor (1996-present) of the Cambridge Series in Chemical Engineering. He has received a number of prior recognitions for his research and teaching from the AIChE, ASEE and the American Chemical Society (ACS). Sigma Xi, the Scientific Research Society, was founded in 1886 and is the international honor society of science and engineering. It now has nearly 75,000 scientists and engineers who were elected to the Society for their research achievements or potential. The Purdue University chapter of Sigma Xi was established in 1909, as the 27th chapter out of the more than 500 chapters in existence today.